Mexican Food, Si or No? I rarely step into a Mexican restaurant since I started my life change (diet). What is there to eat there? Dozens and dozens worth of carbs in almost every meal. Everything is tortilla, taco shell or chip based. I am trying to avoid wheat products and corn products. They make me sick (and Corn is mostly genetically modified now) and they are full of carbs. Let’s look at a few popular places (some healthier than others) and the carbs in each chicken burrito. El Torito: 123g of carbs. El Pollo Loco: 63g of carbs. ONE flour tortilla is anywhere from 14g of carbs to 35g of carbs…all by itself. The beans and rice only add cobs more. If you want to gain weight, this is the way to go. Whole wheat is healthier, but unless it is “low-carb”, it is still a lot of carbs. So, I went to a local hangout, Mission Burrito and to a fast food place, Taco Bell. I ordered a tostada or taco salad (depending on the place) and asked for no beans, rice or tortilla. I got beef, lettuce, cheese, tomato, (guacamole or sour cream) and some taco dressing. The carb count was about 8 grams and it was still delish. It is kind of like a tostada PROTEIN style. And this is GLUTEN FREE! If you do it at home, and you get a low-carb tortilla (like they have at Trader Joes and Costco), you are looking at about 4g net carbs for the whole shell vs. 14-35 for a regular one and it tastes just as good. 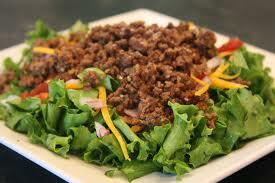 TACO SALAD without the shell: 8g of carbs–Shut the front door! Beef or chicken! DELISH! And taco shells? About 20g of carbs per three. You can have one or two, or if you have three, you need to watch your carbs the rest of the day. AND for SOFT taco shells? It is about 20g of carbs for only ONE! So, watch it. So, you can eat at a Mexican food place if you go this route. Those shells will kill your diet. Remember: You need to stick between 50 and 100g of carbs per day to lose weight, with 6 protein meals a day, 2 small salads a day, 2 small fruits a day, 4 small servings of veggies per day….and if you go over 100g per day, no weight loss for sure! I’ll have to remember that next time I have Mexican food. Sounds yummy even with out the tortilla. Salsa has no carbs at all.